If you love simple and sweet, this card is for you! One day when I had the Fruitilicious stamp set from Clearly Besotted out, I stamped and die cut all of the fruit images. 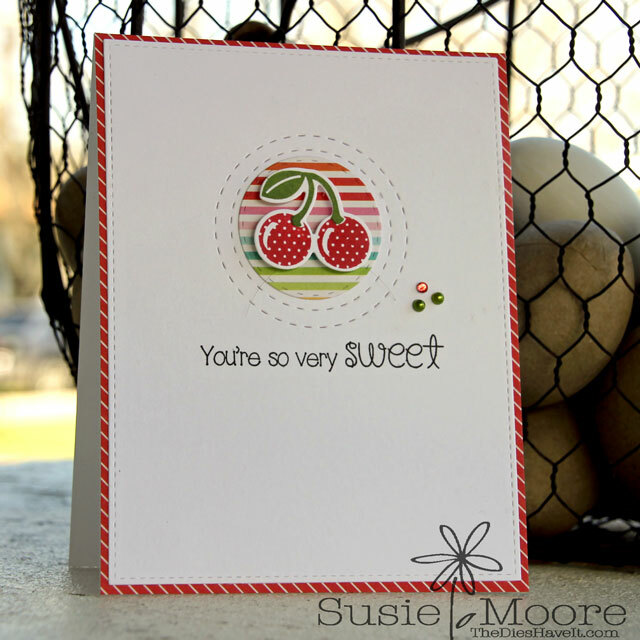 So the other day, I spotted these cherries and a small scrap of striped paper and I knew I had a winning combination! My cards are usually much more elaborate, so when I find a simple card that I really like, I get excited! I'll probably make some more of these soon because I still have more fruit images in my little "stamp pile". I'll be sure to show them to you when I get more done.